On Archer Dreamland Season 8 Episode 8, Archer receives his big break that leads him to Woodhouse's killer when he pays a visit to Dreamland. On Archer Season 8 Episode 7, the world's worst knock-knock joke is used by Archer and Trexler as they try to escape Dutch, who is on the rampage. On Archer Season 8 Episode 6, Archer and the gang attempt to figure out how to avoid unfriendly ghosts but find that roads lead to Len Trexler. On Archer Season 8 Episode 5, Dutch ends up reinvigorated and becomes a new man, while Archer's plans for a ransom exchange go up in smoke. 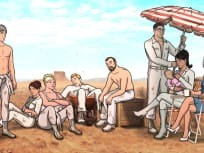 On Archer Season 8 Episode 4, while investigating a kidnapping, Archer reveals too much about Figgis, and Krieger reveals too much about his past. On Archer Season 8 Episode 3, Archer makes an attempt to escape from jail with the assistance of a crazed heiress and a dysfunctional jazz quartet. On Archer Season 8 Episode 2, a mysterious woman hires Archer to help her fake her own death, but he's unable to follow through and rise to the occasion. Archer Season 8 Episode 1 begins the new chapter titled Dreamland in which the entire gang heads back to the 1940s. What's happening and why? Find out in the premiere! On Archer Season 7 Episode 1, Archer breaks into a mission to defend a Hollywood starlets honor, but who screwed it up for them? On Archer Season 6 Episode 13, the season finale, Archer and the gang aim to complete their mission and end their fantastic voyage.